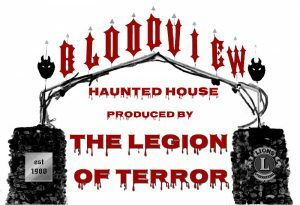 Bloodview has been a staple of the Ohio Haunt Industry for 37 years and is home to the legendary Legion of Terror. Located in Broadview Heights, Ohio, Bloodview is not merely a haunt, it is a theater for things dark and macabre. We visited on Friday the 13th and they were having a special fire show that evening with performers spewing huge fireballs into the air as the crowd around them gasped and cheered. It was quite the spectacle. A $20 ticket is your fee into the attraction and you can go through as many times as you’d like during their operating hours. There is music blasting, actors roaming the queue lines and it is a show from the moment you pass through the archway. You are there to be entertained and you WILL be entertained. The cast at Bloodview are actors, through and through, and they are there to perform for you. All of the main characters are original and they bring those characters to life. The night we were there, there were actors roaming around looking very “Mad Max” post-apocalyptic and speaking in a language all their own. Patrons jumped and squealed as the actors stalked through the queue lines and around the property. We did see a few of the younger actors break character a few times, but the veteran cast stayed true and made use of props and scenes around them to great effect, although it often caught us off guard to see some of the roaming actors in certain scenes that made them look out of place. We felt like the area known as “Baby Doll Island” was a little light on actors but, the majority of the haunt was well staffed. Again, the younger actors were the major offenders in this area as well as we saw brightly colored Nike shoes walking across an elevated platform in front of us and some obvious “street clothes” on some of them. You can definitely tell the veteran actors apart from the young ones here. The veteran actors were all adorned in amazing and complete costumes, some utilizing objects in their costumes (such as a speed limit sign) that most people would have never considered. Layers upon layers of details are used to create some incredible characters. They are also pretty anti-mask here. They have makeup artists on staff but, encourage all of their actors to do their own makeup, learn how to do it well and, it shows. Most of the makeups at Bloodview are very detailed and give the characters the finishing touch. Bloodview is pretty easy to find and GPS will take you right to their front door. The lighted signs at the nearby intersection help point you in the right direction as well. They have an immense parking lot and attendants point you in the right direction to find a parking spot. There are several port-o-potties just outside the gate and the ticket booth/merch vendor are easy to find. The staff that we spoke to were friendly and helped us on our way. As you wait in line to enter the haunt, the queue line is CRAWLING with actors to help keep you entertained and the air is filled, not only with music, but with the screams from other patrons. There is no getting bored here. 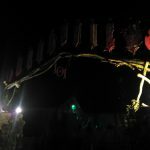 With the music blasting, the decorations/props in the courtyard and the costumed actors roaming around, there is no mistaking that you are definitely at a haunted house. It was all very high energy, high speed and high intensity. This mirrored what you found once you entered the actual haunts, with the exception of Baby Doll Island, which was very quiet…isolated…and much more relaxed than the rest of the haunt. We didn’t notice any sound effects playing throughout the haunt. Most of the soundtrack was provided by the cast and patrons. Other than a standard vortex tunnel, there wasn’t really anything here in the way of “special effects.” The scenes are all detailed exquisitely and their use of lighting was impeccable, there just wasn’t anything “flashy.” This is an old-school haunt, through and through, and they like to put the focus on their actors and scenes, not fancy mechanical gizmos. This haunt does not have a specific theme. If you want to get scared and jump, this is definitely a place to go. Their actors are well trained in how to draw a scream out of people and they do it with precision. No member of your group is safe from a scare and they can come at you from some very unexpected places. They are great at drawing your attention in one direction, while someone gets you from the other. They have scaring down to an artform. 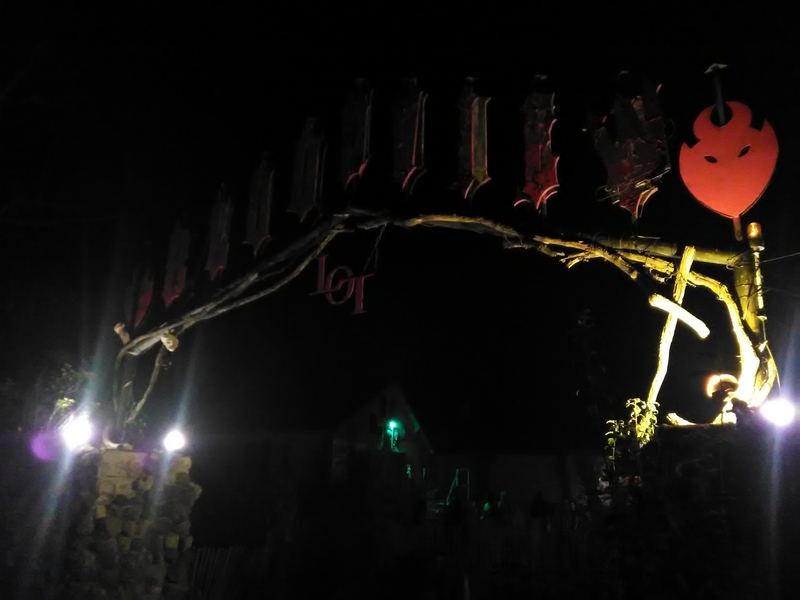 We made the trip through all the sections of the haunt in just about 30 minutes. The standard ticket price of $20 puts them right at the 1.50 average for Minutes Per Dollar value. They have also managed to cram so many different aspects into their space that, coupled with the fact that you can go through multiple times in one night, makes this a no-brainer as far as getting your money’s worth goes.